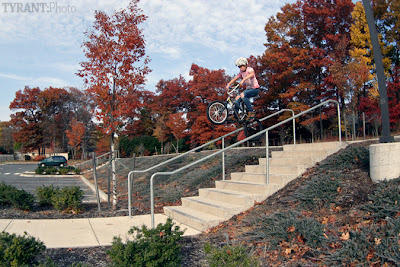 So T and I headed over to ride the new backyard ramp of "Tiny Tyrant" Brandon Begin. The set-up is really fun, its a 6 foot quarter on one side with a 4 foot flat deck spine in the middle to a 5 foot quarter on the other side. Brandon and his buddy Aaron were already bombing around the ramp when we showed up. Brandon was going pretty big for the little guy he is! After some ramp riding we took a ride down the street to a local school and Brandon proceeded to huck himself down a 9 stair set going mach speed. It was a super fun day and it was great to ride my BMX bike...it hasn't been touched in weeks! Thanks guys! Tiny Tyrant, tiny bike....not so tiny gap!